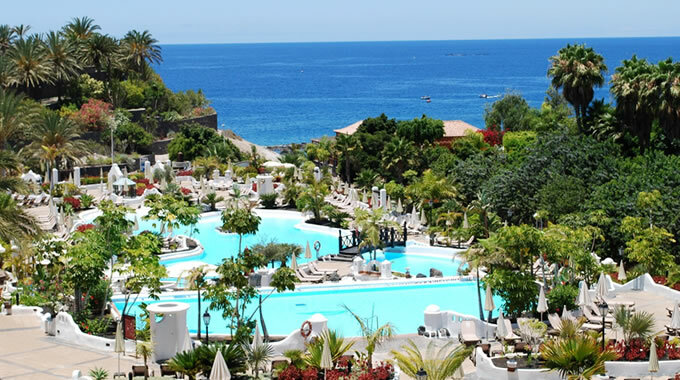 The Dream Hotel Gran Tacande offers exquisite mountain, garden or sea views from every one of its 255 spacious room and suites. The name itself, -Gran Tacande- is derived from the ancient Gueanche language of the Canary Islands and means -volcanic stone,- an important element in the design of this great mansion, where a stay is like taking a journey back in time to the colonial period of Canarian history. Comprising 4 unique architectural styles from this period: San Sofe, San Sebastian, Malpais and Casa Fuerte, the Dream Hotel Gran Tacande is a visual masterpiece offering 3 fantastic restaurants, 3 bars, multiple swimming pools, a comprehensive Spa and Wellness Center; and a spacious, thoroughly modern conference center. Experience the Dream Hotel Gran Tacande and discover a majestic manor exuding unparalled comfort, exemplary service, and natural charm near the ocean, near your dreams. Additional information: Children age 6 and under stay free in the room with parents and in existing bedding. Children age 7-12 receive a 50 pct reduction. Children over this age will be considered an adult. The Dream Hotel Gran Tacande offers a fine selection of rooms and suites sure to meet the needs of any guest. Refined luxury meets colonial style resulting in a spacious, elegant comfortable design. Created with great charm and comfort, all the rooms are very spacious and give spectacular views of the hotel's gardens and pools. Rooms with breathtaking Seaviews are subject to availability and surcharge. 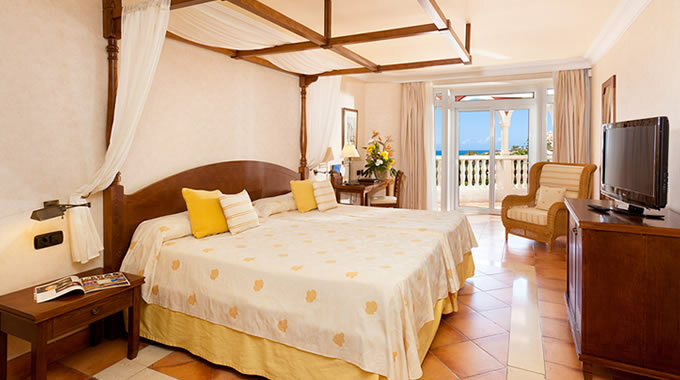 All rooms have the typical colonial bed with a beautiful canopy to catch your dreams. 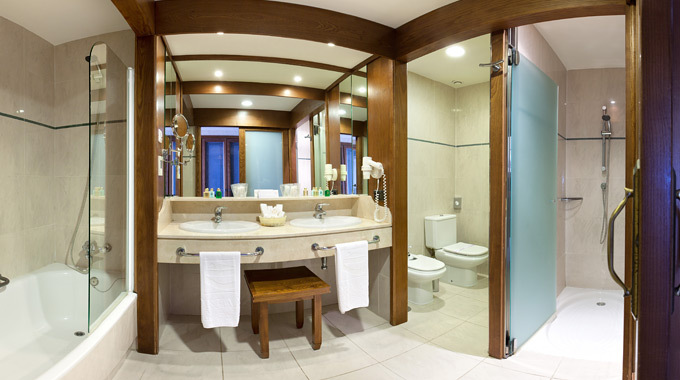 The bathrooms offer jet massage showers, a bath tub, and are well equipped. All the suites have a Jacuzzi. Each room offers internet connection facilities, air-conditioning and modern amenities that today's expert travellers can expect. *We have 70 connecting rooms and 2 rooms accessible for disabled rooms available. Creating a warm atmosphere, these rooms with the typical colonial style in terracotta colours, are spacious and offer a high level of comfort, including a small table set and sofa bed. Outside there is a terrace with additional table set, chairs and a sun bed from where you can enjoy fabulous views of the gardens, pools or mountains. Rooms offering breathtaking seaviews are also available (subject to surcharge). In summation, an elegant collection suitable for double or single occupancy. 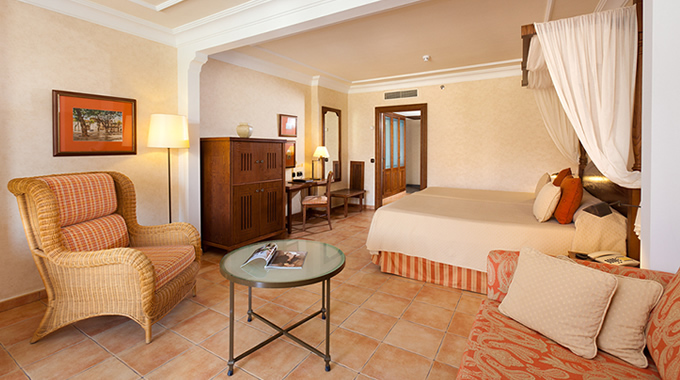 The Dream Hotel Gran Tacande offers 205 double superior rooms. These rooms include a variety of luxurious amenities such as canopied beds, separate bath and shower, satelite and pay tv, safe and more. 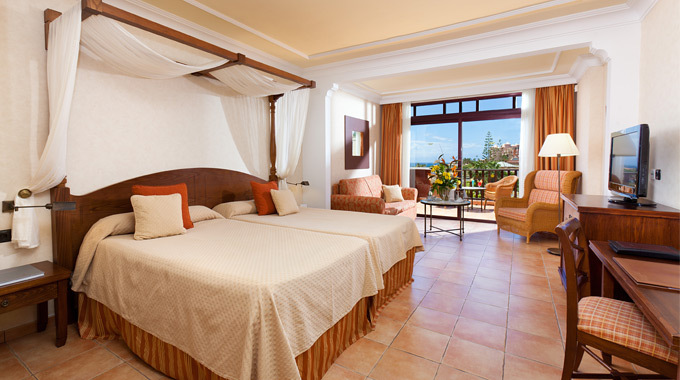 60 m2 for a private and intimate stay, the Junior suite offers beautiful views of the beach, ocean and the Island of "La Gomera" or the gardens & pool. Each of this spacious suites features luxury and warmth with the typical colonial twin bed with a canopy, a walk-in closet, a large bathroom with a bath tub, a jet massage shower and a Jacuzzi; everything you need to revitalize your body. The room includes a small set of seating table and a sofa bed. The large furnished terrace is a great place to relax. 80 m2 for a private atmosphere! As you walk in, you will see the beautiful living room separated from the bedroom, decorated with a warm colonial style and including a sofa bed. The terrace is large and well furnished, offering splendid views of the gardens, the beach, or, seaviews across to the neighboring Island of La Gomera (rooms with seaview are subject to a surcharge). The spacious bedrooms have a sitting area and a typical colonial bed with a long canopy. The large bathrooms have a bath tub, a jet massage shower, and a big Jacuzzi. Three of these senior suites have the Jacuzzi on the terrace. 215 m2 of elegance, offering marvellous panoramic views of the ocean, and the east coast. It is a perfect place for exclusive private living decorated in a contemporary style, with its hall and dining room (6) and a spacious sunny terrace with a sitting area and sun beds. There are two large double bedrooms and two luxurious bathrooms, each of them including a jet shower massage and a Jacuzzi. For a special stay, there is the Imperial Suite at The Casa Fuerte quarter with a private reception lounge for the VIP guests. This luxurious and modern suite offering 215m2, is decorated in a contemporary style with light colours and wood finishes. The Dream Hotel Gran Tacande offers 3 distinctive restaurants, a delicious range of international and local Canarian cuisine, as well as 3 bars offering holiday favourites such as tropical cocktails and a fine selection of vintage wine. Choose from convenient, plentiful buffet dining to gourmet dining with incomparable sea views. 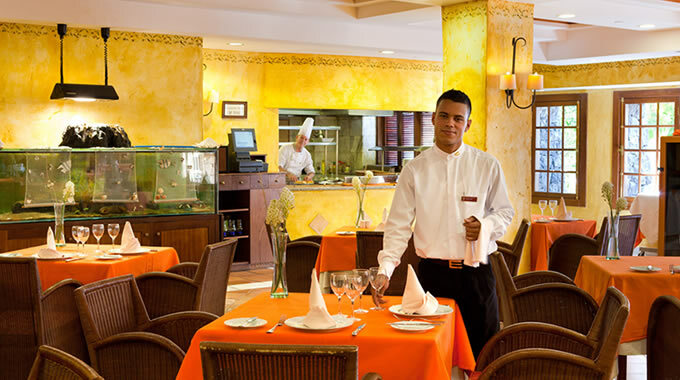 The hotel offers three indoor restaurants for lunch and dining, with a variety of high standard cuisine; two outdoor restaurants, one of them being an Italian restaurant and a Coffee & Pastry shop. Each one of them offering an integral service to satisfy the pleasure of great taste. Our bars will welcome you with a chill-out atmosphere to enjoy a cocktail in the afternoon, to admire the sunset in the evening, or to simply enjoy the piano music. The Dream Hotel Gran Tacande's Gourmet Restaurant Bocoy combines haute cuisine, an award winning wine cellar, a terraced dining area and spectacular sea views across the famous "Playa del Duque" beach to create the perfect atmosphere for any special dining occasion. The Bocoy will amaze you by combining great sea views, an exclusive atmosphere, and its exquisite Canarian, Spanish and international cuisine. This restaurant will seduce you with its delicious creations, like: Crayfish salad, Duck liver with caramelized melon, Codfish with a sauce of courgettes à la marinière... or a glazed "ropa vieja" (a Canarian speciality). And for dessert, strawberries with "wine powder" - of "Presas Ocampo" wine from the hotel's own wine cellar, which also provides a wide choice of international wines. For the ones who like to keep a light style, a "healthy dish" offer of the Vitanova Spa will surprise you. The new Bocoy terrace, overlooking the promenade, invites you to enjoy a marvellous atmosphere with its delicious specialities. Open every day from 18:00 to 22:00 hrs. The Dream Hotel Gran Tacande's Bocana Grill serves delicious poolside lunchtime meals and snacks. 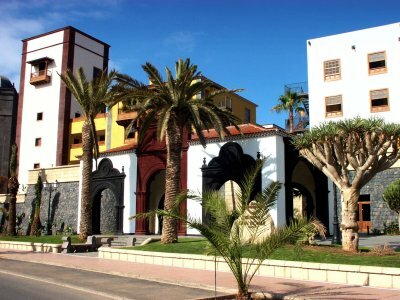 The restaurant specializes in grilled seafood, creative canarian delicacies as well as traditional lunchtime favourites. The Bocana restaurant offers you the possibility to enjoy lunch in a friendly atmosphere with a fabulous view over the swimming pool towards the ocean. Taste the delicious grill and a la carte menu, starting with its classic, Spanish loin of pork, its lobster from the own aquarium, the great "Chicken Adeje style" and "Tuna Yakitori style "! These are the pleasures of good taste. Its friendly and expert service is sure to make your perfect lunch. And later enjoy the famous "Canarian cocktail" at the Bar! Open: every day from 13:00 - 16:00 pm, the Bar opens from 10:00 (for snacks) until 18:00. The Dream Hotel Gran Tacande's Zurrón Restaurant offers a fantastic buffet style selection of international cuisine and show cooking that is sure to please any guest. Special dining options are always available for our youngest guests and guests with special needs such as vegetarians and diabetics. 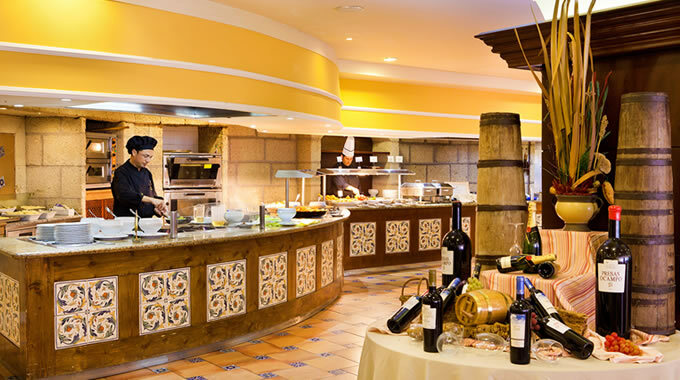 Located on the main terrace of the hotel, the Zurron is the ideal place to start your day with a fantastic breakfast and also enjoy dinner with a great variety of international, Spanish and Canarian specialities. Moreover the guest will enjoy its "thematic show cooking" with Italian, French, Thai and Japanese style dinners among others. The restaurant buffet offers an indoor area with a big, air-conditioned, warm style dining room, and an outdoor area with a Cascade and view towards the swimming pools. A great place to share and enjoy! Open every day, from 8:00 - 11:00 and from 18:00 - 22:00 hrs. Located next to Reception, with a great variety of classic and exotic cocktails, comfortable seats, a nice terrace and Piano music in the evenings, the Hall Bar is ideal for relaxing among friends and family, offering different musical presentations, accompanied by the piano and other instruments. In the summertime a musical show invites you to join the terrace, called the "French patio", to enjoy the rhythm of music with tasty cocktails, and simply have a wonderful time. Open every day, from 10:00 hrs to 01:00 hrs. Open in high seasons, The Dream Hotel Gran Tacande's Lobby Bar is a cosy place made of wood, hidden in a certain way, but creating a fantastic atmosphere to share the nights. This bar also presents live music shows on a big stage, offering comfortable seats, a place to dance accompanied by a great variety of beverages, from a classic shop beer to an exotic cocktail. Open every day - high season - , from 18:00 hrs to 01:00 hrs. 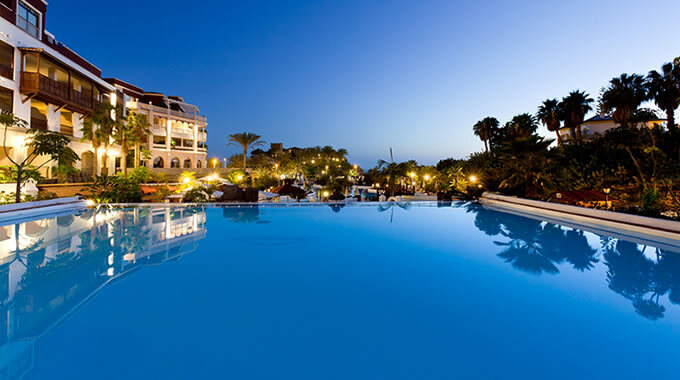 Located along the famous -Playa del Duque- beach in Costa Adeje, the most exclusive area of southern Tenerife, the 5-Star Dream Hotel Gran Tacande epitomises elegance and distinction. The Gran Tacande is the ideal place to turn your meeting into a successful event, offering a comprehensive service to satisfy any special needs for business meetings, incentive groups, Congresses, Trade shows, executive and corporate meetings, Galas or any other type of event." The Business Centre Lobby provides easy access to all conference halls and meeting rooms while also serving as a great location for coffee breaks, cocktails and gala dinners. The Dream Gran Tacande's business centre offers more than 2000m2 of conference halls and meeting rooms such as the Teide conference hall. This modular conference hall can be configured to serve as one main hall seating up to 450 people or in a variety of 1, 2, 3 or 4 room configurations for smaller groups. Perfect for medium sized groups, the Guajara Conference Hall seats up to 225 people and offers a comprehensive range of audiovisual possibilities as well as an attractive mixture of natural and incandescent lighting. The Chasna meeting room is perfect for meetings of up to 40 people. Like the main conference hall, this meeting room is modular and can be configured into 1 main meeting room or 3 small meeting rooms for breakout sessions. The Dream Gran Tacande additionally offers 3 other meeting rooms for private meetings and breakout sessions for groups of 5 - 12 people. The Business Centre has two offices for the clients, and can provide internet connection (ADSL, 1MG), fax, photocopy and telephones. In the conference area, some halls offer a sound system; for the others we offer a selected list of different providers specialized in video and audio systems. We offer the services of the "Vitanova Spa" to relax and revitalize your mind, body & soul. - Valet parking, and free parking space for all guests. - Concierge service, 24-hour in-room dining. - Vitanova Spa Thalassotherapy wellness centre. - A fully equipped Fitness Center, at the Spa. - Beauty Centre, at the Spa. - 2 outdoor swimming pools.